Okay, Jack, you can try to act like you aren’t eaten up with Duck Dynasty, but I know the truth. Even when an old episode comes on, I bet you pause the TV clicker and watch a few minutes and laugh. Let’s face it, the true faith and family theme of the show is a breath of fresh air in an otherwise trashy world of television. They are different, for sure. But they are real. And that’s what makes the show so successful. And it’s what makes folks around here so proud of their success. They don’t just take. They give and give and give. And there’s at least one more season coming. Rumors of the show being cancelled because the ratings dropped down to 4.3 million viewers are false. C’mon, man. 4.3 million viewers? That’s more than any other reality TV show will EVER draw. Season 7 is in the final editing mode right now. And the new season will begin tonight, Wednesday, Nov. 19 — just a few quacks short of the opening of duck season in our area. Show are on the A&E channel at 8 p.m. Central. A while back, the Duck family took a “vacation” to Hawaii and Phil felt trapped — hung out in the motel room watching movies. Can you imagine how he will feel this year in the season opener when the family goes all the way to find it’s roots in Scotland? If you think this one will be boring, well, as they say over there, “Yer bum’s oot the windae!” Of course, the competitive group has to take part in some of the Highland Games. Playing in the rain is nothing new to these folks. Lots of other details of what is on the new shows have leaked out, but just wait and watch if you are so inclined. The new season may be the West Monroe family’s best, because they really may be getting tired of this and everybody knows it won’t last forever. There is room for football and ducks this time of year. 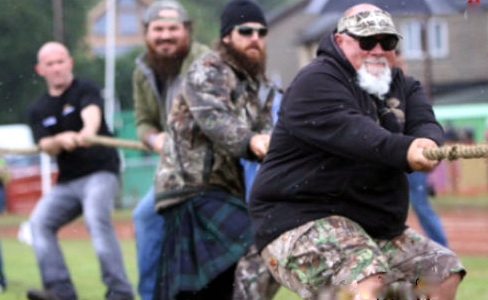 This might be worthwhile just to see Jase, Willie and the crew dressed in “skirts”…okay, kilts. So put on your bandana, grab your sweet tea, grow a beard and just sit back and enjoy the fresh duck. AND SPEAKING OF DUCKS: The first official 2014 LDWF aerial survey of ducks is in today, and the estimate of 3.13 million ducks from this survey is over 3 times last November’s estimate of 1.02 million, over twice the most recent 5-year November average of 1.36 million, and over 50% higher than the long-term average of 2.0 million. This is the first November estimate to exceed 3-million since 1995. And that’s just in central and south Louisiana. Surveys are being completed today in northeast and northwest Louisiana. For complete details, go to http://www.simmonssportinggoods.com and click on the Jeff Simmons Duck Report.